Okay, okay, I could go on for days and days about how much I love this seat! Be sure to check out the full review on Courtney's Sweets! 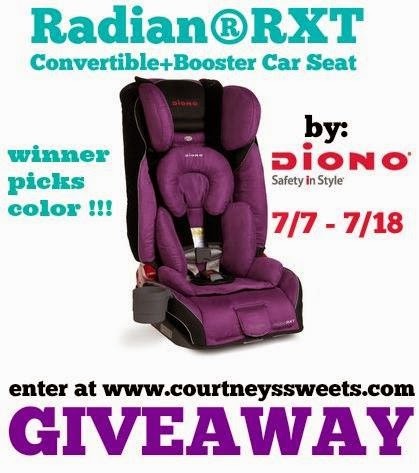 The Diono Radian RXT is available from Amazon for just $269.99 with free Prime shipping in a fun variety of colors! Don't forget to enter below to win one for your little one! Giveaway ends at 11:59pm EST on 7/18/14. *Disclosure: Savy Mommy Moments did not receive any compensation for posting and promoting this giveaway. Please visit Courtney's Sweets for full sweepstakes rules. This blog is not responsible for prize shipment or winner selection. I would love the plum color!